Stop Contamination at the Door! Tacky mats, sticky mats, or adhesive mats, are specially designed mats which are used to keep work areas with controlled environments as clean as possible. Controlled environments are commonly found in aerospace manufacturing technology companies, pharmaceuticals, laboratories and food processing plants. Many manufacturers require clean and controlled environments to operate. Keeping those clean rooms clean can be a challenge. A dirty cleanroom can greatly impact these businesses and cause production or research to grind to a halt. To prevent such mishaps, simply consider using contaminant control such as tacky mats (AKA Adhesive Mats). 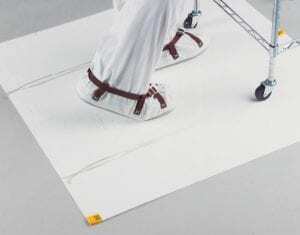 Tacky mats are designed with special adhesive sheets which help remove contaminants, dirt, dust and particles (which are initially carried at the bottom of shoes or cart wheels) and have an adhesive bottom material which secure the mats in place. 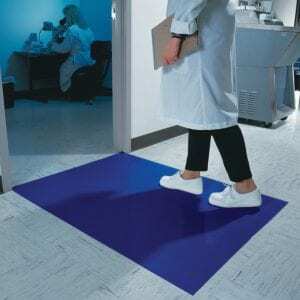 Setting up these tacky mats is pretty easy but care should be taken.. Adhesive Mats should be placed on clean and hard surface just before or just after the ingress/ egress point for each cleanliness or control change, ensuring that its position can accommodate maximum steps for each location. It’s best to consider sizes that are as wide or wider than the doorway. That way, the tacky mats can capture all debris before entering the controlled environment. The ideal length of sticky mats is that it should be long enough to accommodate two steps, considering each foot is situated at different locations. As for the color, we can assume that the lighter the tacky mats are, the better it is to spot whether the mats are ready to be changed and identifying how much dirt has been accumulated. Nevertheless, using adhesive mats with darker shades is not really a big issue as long as the mats is keeping the controlled environment clean and contaminant-free. Tacky mats are available as blue adhesive mats, white adhesive mats, and grey adhesive mats in sizes 18″- 36″ wide and up to 5’ long. To remove a layer, simply peel it back. Be careful not to haphazardly rip off layers. If you can, roll the layer into a ball as you peel. This helps keep contaminates from going into the air. These are just some basic, yet vital tips before you consider using tacky mats. You’ve invested a lot in building your cleanroom, avoiding allowing contaminants in can save you an expensive clean-up of the controlled environment. At Harmony Business Supplies we know that cleanrooms require special attention and products when it comes to maintaining the operation of your controlled environment. If you run or manage a cleanroom, we offer great products designed just for use in cleanrooms of all types. Many cleanroom operations are moving to disposable apparel instead of resource heavy laundered apparel. Disposable apparel eliminates laundering costs and maintenance and still provides comfortable and reliable protection. Harmony supplies cleanroom face masks, cleanroom isolation gowns, lab coats & frocks, coveralls, and shoe covers that are all disposable, easy to use, and reliable. Available in assorted materials, our selection of Cleanroom Gloves are fit for any cleanroom job. 9-12 inches long cleanroom gloves in nitrile or latex and in assorted colors, you’re sure to find the disposable glove for your cleanroom needs. Our Cleanroom Gloves are also available in sterile or non-sterile. Leading brands of cleanroom gloves such as V-Clean, TechniGlove, and Cranberry, at lower prices. Adhesive Mats and Rollers for Cleanrooms are essential in controlling dust and dirt in cleanroom and other controlled environments. Harmony Business Supplies offers cleanroom mops, adhesive roller film, adhesive roller handles, and adhesive mats for cleanrooms in assorted sizes. Stop dirt in its tracks with our Adhesive Mats! Office Supplies and documentation are different for Cleanrooms and clean environments. Our specially designed cleanroom notebooks and cleanroom paper are coated and impregnated with a polymer. This coating keeps the paper from generating particles and contaminating the cleanroom. If you need a latex coating we have these products as well. Keep your area clean with our selection of cleanroom documentation, cleanroom paper, and cleanroom pens designed just for Cleanrooms. Swabs and Applicators in the Cleanroom are often required tools. Make sure you only get the highest quality swabs for work in cleanrooms. Harmony’s selection of cleanroom swabs are from top brands like Chemtronics, Huby, Puritan and TekniSwab to ensure quality, performance, and reliability. We have many different swab materials to choose for controlled environments including knitted polyester swabs, microfiber swabs, foam swabs, ESD swabs and cotton swabs in a wide assortment of sizes. Polyethylene Tape for cleanrooms are used to seal and label safely in a controlled environment. Low Particulate, contaminant free tape wound on a clean plastic core and individually packaged in heat sealed bags in Class 100 environment. Polyethylene Cleanroom Tape has less particulates and higher adhesion than vinyl tapes and leaves no residue when removed. High Quallity Wipers are a must in Cleanrooms! We offer only top quality cleanroom wipers with features that our customers care about. Whether you need cleanroom wipes in materials like polyester, microfiber, or poly/cellulose, we have what you need for the job. Pre-saturated alcohol wipes are also extremely handy in cleanrooms. Shop our assortment of quality cleanroom wipes and save with our competitive prices. If you need cleanroom supplies, we can help. Contact us today (800-899-1255) for even more information on finding the products you need for your cleanroom or controlled environment.